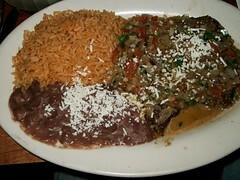 I've been to a lot of establishments that serve frijoles. This, I have never seen. 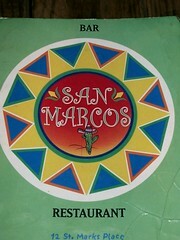 It's the black bean soup from San Marcos, for $5.75. Are you kidding?! It was just black beans! Plus it looks gross - worse than the plantains not poops. Maybe I'm a dummy and black bean soup is standard stuff. That, my friends, is immaterial. I hated it. Excuse me, waiter, please take this back to kitchen, add some rice, chicken, salsa, hot sauce, then wrap it in a steamed tortilla and then serve it. 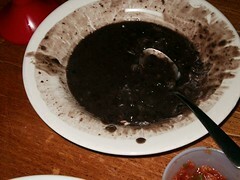 Of course then it wouldn't be black bean soup I suppose. This San Marcos meal was rated: 1.3. You'd think that's all it'd take to make me happy. After all, I have a website devoted to chicken, beans, and rice. Somehow, this plate from San Marcos just didn't do it for me. The food here is much less Mexican than the decor, and less good. This San Marcos meal was rated: 3.6. Walking to and from the train each day down Saint Mark's in NYC's East Village, I'd passed San Marcos a number of times (Map). The place always seems busy; the outdoor seating is lively and filled with happy hour drinks. Check out the official site here. The happy hour deals only exist for indoor seating. Ok...let's step inside.